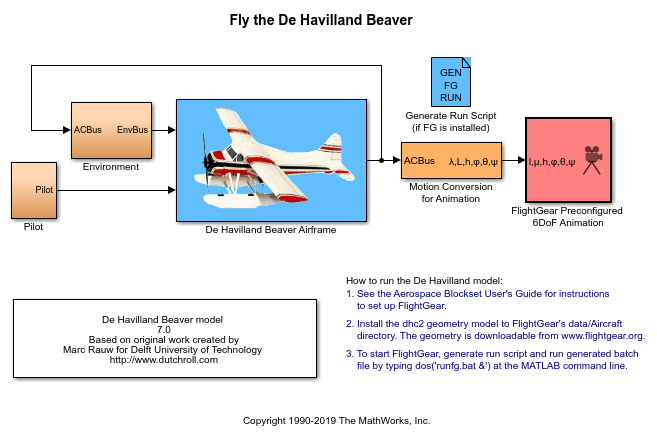 This model shows how to model the DeHavilland Beaver using Simulink® and Aerospace Blockset™ software. It also shows how to use a pilot's joystick to fly the DeHavilland Beaver This model has been color-coded to aid in locating Aerospace Blockset blocks. The red blocks are Aerospace Blockset blocks, the orange blocks are subsystems containing additional Aerospace Blockset blocks, and the white blocks are Simulink blocks. The DeHavilland Beaver model includes the airframe dynamics and aerodynamics. Effects of the environment are also modeled, such as wind profiles for the landing phase. Visualization for this model is done via an interface to FlightGear, a open source flight simulator package. The DeHavilland Beaver was first flown in 1947. Today it is still prized by pilots for its reliability and versatility. The DeHavilland Beaver can be operated on wheels, skis or float landing gear. Speed maximum: 110 kts, Altitude maximum: 10,000 ft, Range maximum: 400 nm, Load: 6 passengers, Crew: 1 member.